I shared 5 videos with my masters level students this past week. They unanimously gave you thumbs up! Backcasting particularly resonated. Thank you for all you contribute to education on these topics. These videos have been an engaging and useful tool for getting people up to speed on how we view sustainability. The fresh and fun approach that Sustainability Illustrated uses to illustrate sustainability is worth the time for anyone! In just 4.5 minutes, the "Business Case for Sustainability" video covers a topic that usually takes me 45 minutes to deliver in a typical presentation. That’s a 10 productivity factor and the clever graphics make the message wonderfully memorable. Beautiful! A drawing is worth a thousand words. These videos are very clear and fun, I use them in my workshops. Great video! It really helped me with my project. Watching this video would be 8 minutes of your day very well spent. 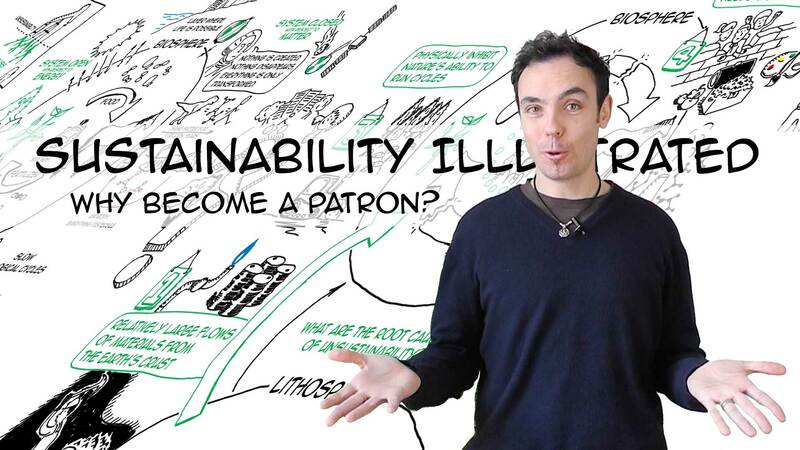 We believe that sustainability education should be available to all for free and Patreon is one of the ways we can generate the revenue needed to pay for the creation of the content. If you want to help us, you can make a pledge of $1 or more that will apply to future new videos. It will take you only 5 minutes: Choose a $$ amount, choose your rewards, you can edit/cancel your pledge anytime. Help us get the word out! Share this page and these videos with your friends and colleagues to diffuse the knowledge. Follow us on Facebook, Twitter and YouTube for new tools, graphics and videos every day to help communicate sustainability in an effective way. Sustainability Illustrated offers short engaging videos to learn about and teach the principles of sustainable development. Our goal is to change the world by making the best sustainability knowledge out there available to all for free in a fun and engaging format. Sustainability Illustrated is a projet of AM Creative Inc. For customized videos, please visit amcreative.org. © Sustainability Illustrated 2013-2019 - A project of AM Creative Inc.